The Fitbit Inspire is Fitbit's latest fitness tracker, and the cheapest wearable you can now buy from the company. The Fitbit Zip, One, Flex and the Alta are gone, replaced with this Inspire HR-lookalike that misses out on the heart rate tracking and a few other features included in the Inspire HR to offer a more basic activity tracking experience. The $69.95 Inspire will count your steps, log your sleep, serve up phone notifications and offer Fitbit's motivational features to keep you moving. It's also waterproof, so tracking can happen 24/7. But for an extra $20, you could get an Inspire HR and get a whole lot more for your money. But is there enough to justify going for this basic Fitbit fitness tracker, which isn't all that cheap and boasts features you can also find on truly budget trackers like the Xiaomi Mi Band 3? After living with the Inspire HR, we spent some time getting to know the cheaper Inspire to find out. Here's our full verdict. If you're comparing the Inspire with the Alta it directly replaces, then just like the Inspire HR, there's a noticeable shift in looks. The discreet, elegant design of its predecessor is out and in its place you'll find a sportier, Charge 3-aping design. You get an interchangeable silicone band holding in place a greyscale OLED touchscreen display, with a single physical button on the left side of the tracker. The omission of the heart rate monitor from the back means it's a little slimmer than the Inspire HR, but not by a great deal. It's light and comfortable enough to wear day and night. Like the Inspire HR, it does support the new clip accessory that will let you attach it to a waistband, belt or other item of clothing. The most noticeable design difference actually lies in the strap. While the Inspire HR uses a watch-style clasp, the Inspire use the button-style strap we've seen on Fitbit's cheaper trackers. We'd have much preferred the clasp option here too. When you're taking off a jumper or jacket it can on the odd occasion unfasten itself. It doesn't happen all the time, but it was enough for us to find it a bit of a nuisance. The screen, however, is identical to the one on the Inspire HR. It's not a colour screen and does lose the fight for space with the black bezel surrounding it, but it's still crisp and makes it easy to view the data. You can swipe and tap on the screen to navigate and it's nicely responsive with no signs of lag. There's no way of adjusting screen brightness, but you can turn off the raise-to-wake screen feature, which is pretty responsive too. The physical button on the side of the screen will simply turn the screen on and off and can be held down to check the battery status, as well as turn notifications and that raise-to-wake screen feature on and off. The Inspire is waterproof up to 50 metres, which means all of Fitbit's trackers are now suitable for being submerged in water. Along with the swimproof design you'll get the same swim tracking skills as the now retired Flex 2. You won't be able to view any of the data on the band, but you'll get to see the basic swim data inside the companion app. When we say the Inspire keeps to the tracking basics we really mean it. It'll track steps, calories burned, distance covered and active minutes. Additionally it'll keep track of your hourly activity and give you nudges to feed those step counts during the day. There's no altimeter to track steps climbed, annoyingly, and no dedicated sports tracking either. You do get the automatic activity tracking, which does a good job of identifying activities as long as you've been doing those activities long enough for them to be recognised. We put the Inspire up against a Garmin fitness tracker and found the step count tended to be within 1,000-1,500 steps of the Garmin tracker, but usually in the same ballpark for distance covered. Generally it reported more steps on most days, which is something we found with the Inspire HR. Is the Fitbit more accurate than the Garmin? It's hard to say because both are based on their own algorithms that take the data from the motion sensors tracking movement to work this out. Thankfully it wasn't far enough off the Garmin to raise concerns. The Inspire also does sleep tracking, and as this is one of Fitbit's strengths it does a solid job of it. It's comfortable enough to wear to bed, and while you miss out the heart rate-based Sleep Stages feature, you get everything else on the sleep monitoring front including a breakdown of your night and your sleep schedule. You can view the duration of your most recent sleep on the device too. And you do still get Sleep Insights, which make an effort to draw insights from your data such as telling you about your most restless nights. In terms of accuracy, it was typically good, and tended to be within 20 minutes of the data the Garmin fitness tracker recorded. As far as motivating you to move goes, those features lie in the inactive reminders and that's really about it. It's a mildly effective way to nudge you to stay moving, but they're easy to ignore too. We tended to check in on steps and hourly goals, and while it's nice to be able to view your last recorded sleep, it doesn't really serve much of a purpose. Like the Inspire HR, in terms of smartwatch features you're getting notification support for calls, texts and apps and that's your lot. For most, that's probably going to cut it, but you're not getting full apps or payment features, which are reserved for Fitbit's smartwatches and more premium fitness trackers. As far as performance goes, these features work much in the way they do on the heart rate packing version of the Inspire. You'll feel a vibrating buzz when they come through and pretty much all notifications have to be scrolled through to read them entirely. Obviously a wider screen would be more desirable for the feature to be more useful, but it does a decent job displaying messages without feeling overly cramped. On top of notifications (which you can turn off from the band), swiping down on the touchscreen reveals options to set up alarms and timers. The Inspire does allow you to display weight and water intake data, but that data must be entered through the app. Fitbit claims you should get up to five days' battery life from the Inspire, and that's been our experience in testing. With no real power sapping features like continuous heart rate monitoring or dedicated sports tracking, those basic tracking features are able to run to around five days without issue. We did encounter some problems in the latter stages of our testing, tied to a problem Fitbit seems to be fixing. There have been reports that the Inspire's battery performance is being hampered by using certain watch faces. The watch faces that appeared to be linked to the problem were temporarily removed. One of those watch faces (Heavy Stats) was one we were using and, sure enough, it brought the Inspire battery down to just a couple of days. Fitbit is suggesting you avoid the Heavy Stats and Valerie faces until it finds out exactly what the problem is. The Fitbit Inspire is a no-frills fitness tracker wrapped up in a design that's sportier looking than the device it replaces. All of those basic features work without issue – but is that enough? When you can get a whole lot more with the Inspire HR for just a little more cash, we're not so sure. 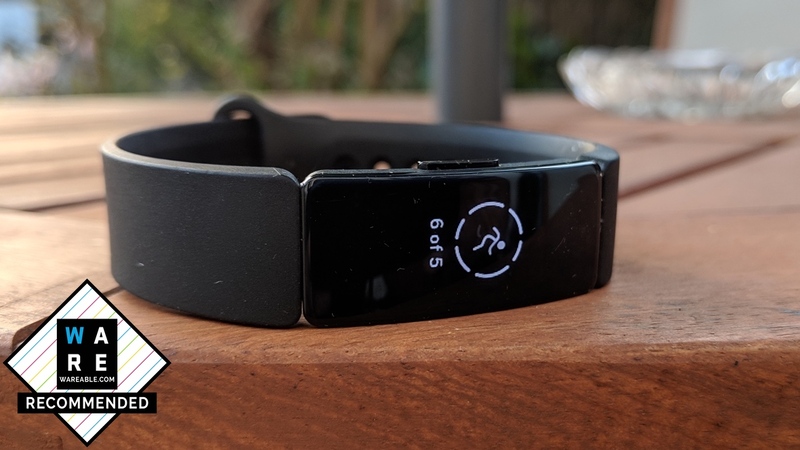 You can also pick up Huawei's Band 3 Pro for the same price and that gets you features like built-in GPS and swim tracking, which has been lost despite the fact the Inspire replaces the Flex. What Fitbit does have on its side is the software, which is still some of the cleanest and easiest to use and will continue to be when Fitbit streamlines it further. There's nothing wrong with the Inspire – but a bit more cash could get you a lot more.